Your iPhone can do a lot of fun and cool things. You can download apps that serve nearly any purpose you might need from a computer, you can download fun games to pass the time, you can email, text, and more. But the heart of the device is the phone capabilities, and it is incredibly likely that you might eventually need to call someone that isn’t already a contact, or for whom you can’t tap a number on a Web page or in an email to call. But making a call on the iPhone can be a little tricky if you haven’t done it before, so you may be having some trouble. Our article below will show you where to find the keypad in the iPhone’s phone app so that you can enter the number that you need to call, then make a call to that number. The steps in this guide were performed on an iPhone 7 Plus, in iOS 10.3.3. This guide assumes that you have an active cellular plan on the iPhone from which you are trying to make the call, that you have a phone number, and that you currently have cellular service in the location from which you are trying to place the call. Step 2: Touch the Keypad tab at the bottom of the screen. 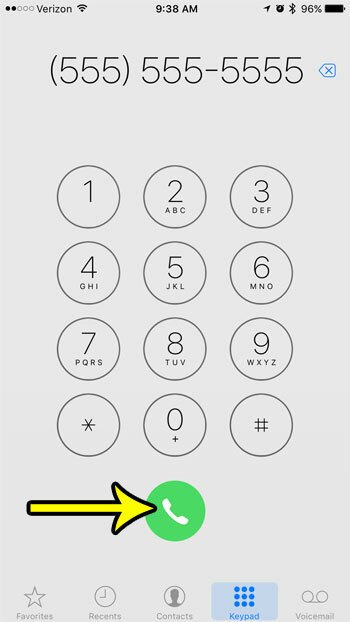 Step 3: Dial the number that you wish to call, then tap the green phone icon at the bottom of the screen. Are you plagued by a telemarketer or spammer that is calling you very often? Learn how to block a call on your iPhone and prevent that number from calling, texting, or FaceTime-ing you.